Some children on the autism spectrum enjoy noises. This activity allows them to control the noise by playing with their personalized noise maker. Cut small pieces of wax paper to go over the ends of the tubes. 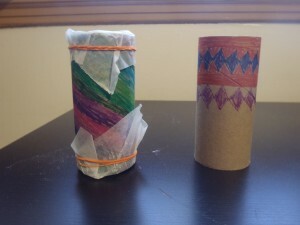 Have children color and decorate the cardboard tubes any way they want. Attach wax paper to one side of the tube using rubber bands. Fill the container with 2 tablespoons of dried beans or rice. Secure the other side with wax paper. For some children who may have trouble coloring, use decorative tape to cover the tube. Make sure the rubber bands are tight around the ends, you may need to double wrap them. You can also decorate these noisemakers with stickers, beads, or other items. -What color do you want to color the tube? -What are your favorite colors? -Do you think the noisemaker would sound different if we put something else inside? -Would do you think it should sound like if there were pennies inside the noisemaker?